In an evening to meet Utah State University Eastern’s new career and technical education administration, those present got to hear about new funding, programs and the changes in the CTE. 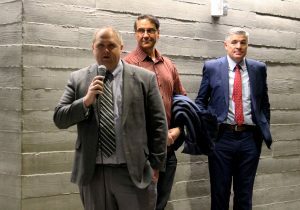 Associate Vice President Greg Dart started the event by introducing himself, Associate Vice President for CTE Dr. Gary Straquadine and USU’s Vice President of Regional Campuses Dave Woolstenhulme. Regional Campuses Dave Woolstenhulme. thinking when it comes to higher education. In his new role, “We want to send a concise message to Southeast Utah about CTE programs,” he said. Before this campus was Utah State University Eastern was College of Eastern Utah. CEU was well known for its CTE programs and that is why it has been easy to bring in programs that work. “It has been almost 10 years since the transition from CEU to USUE and it is now time to start netuning these pro- grams,” Straquadine said. In Southeastern Utah, CTE programs are a big economical force in the community. 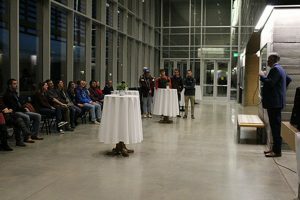 Over half the students attending USU Eastern, Price and Blanding and USU Moab are CTE students. tuition. At USU Eastern, we charge CTE students $8 per content hour while other technical schools in Utah charge students $2 an hour,”Straquadine explained. The first step to chang- ing CTE tuition at Eastern is to prove to the Utah Legislation that CTE is economically important in the Southeastern Utah communities. USU will meet with the legislators by the end of February about the tuition changes. According to Straquadine these changes to the CTE program will be rapid and happen in the next one to two years. These changes will involve students, faculty and local businesses. The plan is to make and promote stackable certificates; get a certificate and move onto an associate and bachelors degree. Woolstenhulme said that as long as everyone keeps an open mind and looks toward the future, these changes will be easy to accomplish. also the only campus in the state where you can get a certificate and doctorates. USU wants to build more four -year degrees at Eastern and bring more face- to-face faculty to the Eastern campus.